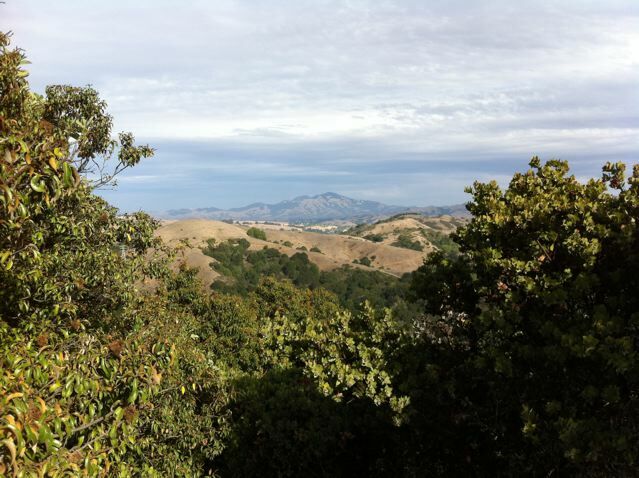 Highlights: Explore the newest open space around Lamorinda – Carr Ranch! 604 acres just opened on October 14th, 2017. Perfect if you’re looking to get away from it all and want a real workout. Directions: Take Canyon Road south from Moraga. Take a left on Camino Pablo and take it all the way until you reach Rancho Laguna Park. Park in the parking lot just past Knoll Drive. Trailhead: The EMBUD trailhead and sign-in is at the back of the park. Carr Ranch was owned for over 100 years by the Carr Family. Muir Land Trust was able to purchase it in November 2016 with the help of $7 million in donations received from individuals, foundations, agencies, and businesses. The 604 acres of unspoiled ranch and wild lands is now permanently protected and open for us all to enjoy! The only prior inhabitants of Carr Ranch have been wildlife and cows grazing. After climbing a little hill you’ll take a right on the Rancho Laguna Trail and go about .4 miles to reach a sign for the Rocky Ridge Trail (heading East). The trail runs adjacent to a creek and then ascends through a forest of coast live oak and bay laurel trees. You may notice many logs on the ground with bracket fungi growing on them (see picture). Over 1000 varieties have been discovered! These and other decomposer fungi are the first step in food chains that feed on decomposed plant material. Anyway, then you’ll emerge onto a high meadow and continue climbing to the top of the first hill at 1097 feet. After descending down the other side, and hiking about 2 miles or so, you’ll reach the year-round Buckhorn Creek, an untouched riparian habitat. It drains into the Upper San Leandro Reservoir and so all of this land is part of the huge watershed for the Reservoir. And as you cross the creek, imagine for a moment that you’re far under water. It could have been. At one point in the late 80’s EBMUD proposed to build a new reservoir in the Buckhorn Creek Valley, but fortunately it was opposed and finally shelved. After another tenth of a mile, you’ll reach the turn off to the Carr Ranch Loop Trail (see picture). Take a left, instead of zig-zagging up the hill, and soon you’ll reach the 3.5 mile loop. We went to the right, hiking the loop counter-clockwise. During the first part of the loop you’ll hike through the trees, adjacent to Buckhorn Creek. We noticed many, many acorns on the ground, which were a staple for the Native Americans that lived in this area. Soon you’ll begin climbing and climbing, up, up, up to the ridge that surrounds the valley. At about 4.5 miles of hiking you’ll reach the high point of 1275 feet. There is a fire road heading off to the right that actually leads to the back of St. Mary’s College. But the Loop Trail continues straight. Enjoy the vistas of undeveloped land in all directions! After another mile and a half you’ll reach the junction where you started on the loop. Return the same way that you came. During your hike you may notice a shrub that looks like this (picture) and somehow thrives on these dry hillsides. It’s called Coyote Brush. Like all native plants it has evolved to survive without water from May through October. We have shifted most of our yard to native plants and have a couple large Coyote Brush plants that seeded themselves and didn’t cost us a penny! One other thing you might notice is that there is almost no noise of any kind on Carr Ranch, except for planes flying overhead. Unfortunately there is a bit of a highway overhead with planes heading East from SFO and Oakland. This is becoming a bigger and bigger issue. Save Our Skies is fighting to protect our skies in the East Bay. Their motto is “Too many, too loud, too often”. You may encounter cows on this trail. No worries. Just walk in a wide arc around them and make sure not to get between a mother and a new calf. EBMUD and the East Bay Regional Park District both lease some grassland areas for cattle grazing. This is to keep the grass height down, which lessens the fire hazard during the dry season. Muir Land Trust has now protected over 3,000 acres in the East Bay, all dedicated to open space forever! Learn more at www.jmlt.org. Difficulty: Easy – Medium. Fine for kids if they can handle the length. 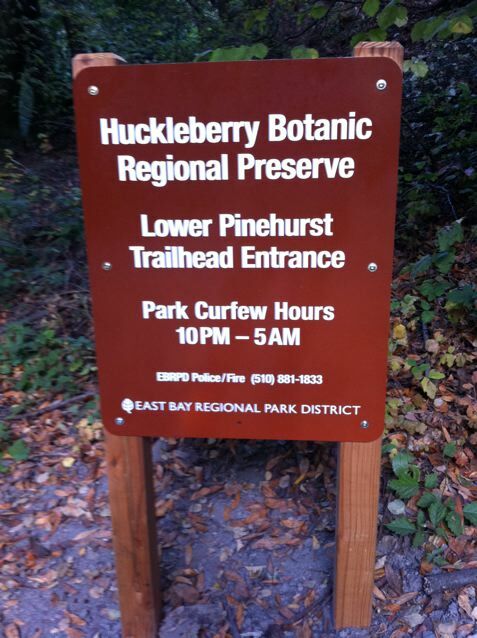 Highlights: Huckleberry Botanic Regional Preserve is one of the jewels of the East Bay Park system and this hike provides quick access via Pinehurst Road versus going all the way to the main entrance on Skyline Blvd. This hike makes a nice loop through a unique array of native plants found only in a few areas along California’s coast and rare to the East Bay. A great hike to impress an out-of-town guest. Trailhead: You will see a gate with “Fire Trail 41-17” on it. 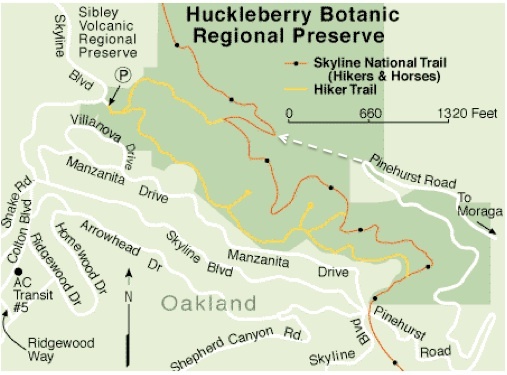 The 240-acre Huckleberry Botanic Regional Preserve is a unique park in the East Bay Park system. It’s not just a protected open space—it’s an ecological marvel. The native plant community here is found nowhere else in the East Bay. The plants originated in the distant past along the southern coast of California when the climate was more moist and tempered by cool coastal fog. The same plants can be found on the islands off the Santa Barbara coast! The soil in parts of the preserve is rocky and lacks nutrition for all but the hardiest chaparral species, such as Manzanita. One of the plants to look out for is the rare and endangered Alameda Manzanita. 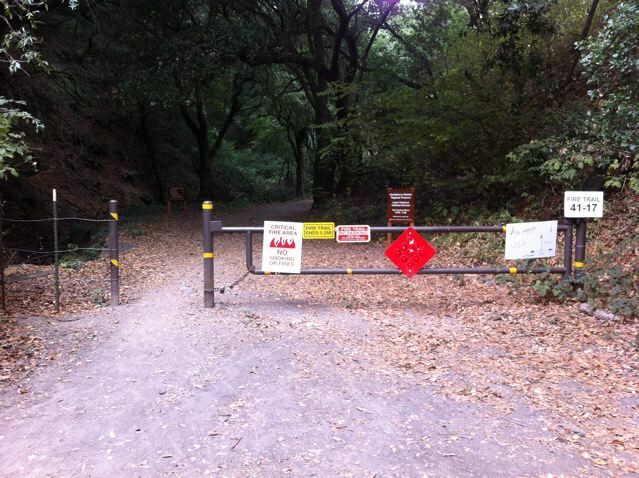 Park on the side of the road and begin your hike by walking past the gate and adjacent to the San Leandro Creek. After about a quarter mile, and a short climb, you will reach a junction. Going right leads to Sibley Volcanic Preserve and going left takes you to Huckleberry. In either direction you will be using the Bay Area Ridge Trail or Skyline National Trail. The Skyline National Trail runs for 32 miles through the East Bay Hills and is part of the Bay Area Ridge Trail, which makes a 550+ mile continuous trail along the ridgelines overlooking San Francisco Bay. After veering left, hike another tenth of a mile and you will reach the “lower trail” of the Huckleberry Loop. The lower trail winds through a mature bay forest. Take a left. About a half mile of hiking will bring you to a junction with a “shortcut trail” that heads up the hill through the woods. Continue straight. When you reach the second junction, take a right. This is the far end of the Huckleberry Loop. You are now on the upper trail. The upper trail is more diverse and has most of the native plant markers. So, if you printed out the self-guided nature path, then keep a look out for markers. After about a mile on the upper trail, you will reach a junction near the entrance to the park. Take a right and descend back down to the lower trail via a few switchbacks. You will reach the junction where you started.